California has a lot of valleys. But only the the valley. The San Fernando Valley. And yes, I know how big California is, and how many mountains it has, and how many valleys. But if you mention the valley, you are talking about the San Fernando Valley. The San Fernando Valley is, technically speaking, part of Los Angeles. Places like Van Nuys, Sherman Oaks, and Canoga Park are actually just part of the city of Los Angeles. That is, they are city of LA water, city of LA police, that sort of stuff. To make it even more confusing, there's Burbank, which is in the valley, but they actually are their own city, with their own mayor, police force, etc. I lived in the San Fernando Valley in the 1980s, and since I'm a bit of a map geek, I started being very specific about where I lived. That's because there's the Conejo Valley (where Thousand Oaks is), the San Gabriel Valley (where Pasadena is), and LOTS of other valleys. But when someone at a party in Santa Barbara asked me where I lived, and I said "the valley", and I was asked "which one?" - my host jumped into the conversation to clarify that there was only one "the valley". The valley of the 1980s was the time of "valley girls", which became recognizable in popular culture by saying things like "gag me with a spoon!" (I still have no idea what that's supposed to mean). Valley girls shopped at the Sherman Oaks galleria. If you're interested in making the San Fernando Valley your home, and would like to know where to live, look at it as if it were a bowl, with the most affordable housing in the center and the most expensive stuff along the edges. I worked in Warner Center, which is in Woodland Hills, where the rent was so expensive that I couldn't even imagine it, and I lived in a "less-than-fashionable" area nearby called Canoga Park. And with all due respect to the nice people of Canoga Park, it wasn't a place that I exactly bragged about. So if you live in places like Tarzana, or Encino, you say so, but if not, you just say that you live in the valley, if you know what I'm saying here. 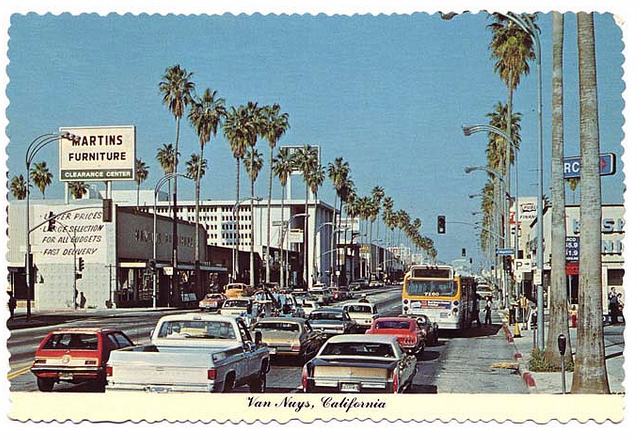 Image at the top of this post: Van Nuys, California in the 1970s. The valley.